Frank Pozen's Big Bad Blog: Marloes Coenen vs Julia Budd for the Bellator Women's Featherweight Championship...on the prelims! 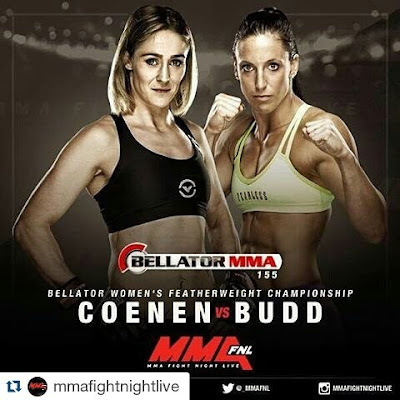 Marloes Coenen vs Julia Budd for the Bellator Women's Featherweight Championship...on the prelims! Bellator announced today that Marloes Coenen will face Julia Budd on Bellator 155 May 20 at CenturyLink Arena in Boise, ID. The twist is they're going to air this as the featured prelim on the Bellator TV website instead of the main card. The negative fan reaction to this has bombarded Bellator Director of Communications Danny Brener's Twitter. This is probably a fight that should have happened at least a year ago. But Bellator decided to get cute and have them fight other fighters first. The only thing we learned from that is there are very few good 145lb female fighters. And then Marloes got hurt so they've been waiting on her. So the match is somewhat anticlimactic. And then to put the match in the prelims just adds insult to injury. When asked about this by Hunter Homistek of MMA Fighting, Brener said "We felt that this amazing title fight was the perfect vehicle to help build awareness for our preliminary stream and boost the viewership for Bellator.com and the Bellator mobile app". Ugh, I hate PR speak. Obviously they are parroting the UFC and how they promote Fight Pass. But you don't put a title fight, any title fight, on the prelims. It's disrespectful especially to an MMA pioneer like Marloes. Then after he was bombarded with Tweets, he said "I have never seen so much attention paid to a preliminary fight card announcement". And that's the problem. He's just looking at it as a prelim fight while anyone with a brain would expect a title fight to be at least a co-main event. Keep in mind that Brener is a freelance PR guy who works for whoever will pay him. Maybe he doesn't understand the fight business. To me it seems like a Spike TV cutesy poo decision that they look at as outside the box when it is actually boneheaded. As for the fight. Marloes is more experienced and more diverse than Julia. I've never been that high on Julia as an MMA fighter. She's a one dimensional kickboxer but there's no money in kickboxing in North America. She's weak on the ground and that's one of Marloes' strengths. There's still time for Bellator and Spike to smarten up and give this title fight the position on the main card that it deserves.